A Bosnian Serb war crimes suspect arrested in Argentina last year is on his way to the international war crimes tribunal in The Hague, officials say. Milan Lukic had been on the run for more than five years, when he was arrested in Buenos Aires last August. He was indicted by the UN's war crimes tribunal for crimes said to have been carried out during the Bosnian war. Lukic is also wanted in Serbia, where he was sentenced in absentia to 20 years in prison for war crimes. In the indictment from the tribunal at The Hague, Lukic is accused of forming a paramilitary group in 1992 which worked with local police and military units to exact a "reign of terror" against Bosnian Muslims in the Bosnian city of Visegrad. The indictment documents two cases in which Lukic barricaded people in buildings before setting fire to them, killing at least 140 people. In 2003, a court in Belgrade found Lukic and three other men guilty of torturing and murdering 16 Muslim civilians whom they abducted from a bus travelling from Serbia to Bosnia in 1992. Serbian officials say Lukic headed a paramilitary group believed to be responsible for abducting, torturing and killing the victims - all nationals from the republics that constituted the former Yugoslavia - before throwing them into a river. 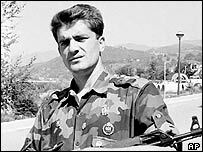 The incident - known as the Sjeverin case after the town where the victims were kidnapped - was the most serious crime to take place on Serbian territory during the Balkan wars in the early 1990s.